Snorkeling is a fun, safe, and easy way of seeing the incredible world beneath the waters of Fujairah. 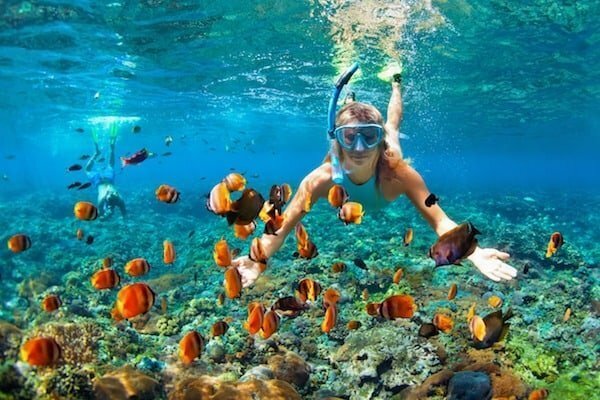 The snorkeling tour is suitable for both young (at least 8 years of age) and old and it’s also a budget-friendly water activity because you just need a diving mask and a snorkel. You can also wear swim fins (optional) if you want to propel faster in the water and without exerting too much effort. Plus, you don’t need to worry about wearing special clothing because you can just put on your regular swimwear and you’re off to go. To boot, there’s no pressure to be a great swimmer to participate in this activity as you can snorkel with a lifevest on. The fun begins as you travel to the site via a luxury boat with amenities like a sundeck, sunbed, and its own private bathroom. When you get to the diving location, you’ll be given your snorkeling gear and you’re all set to explore the marine environment and see the creatures that reside within. We serve complimentary soft drinks and water on board to keep you refreshed and a sumptuous BBQ lunch to satisfy your taste buds and give you plenty of energy for more snorkeling action. You have to be in good physical health and have at least basic swimming skills to go snorkeling. Children who are 8 to 9 years old must be accompanied by a parent who has at least basic swimming abilities. Please bring your valid original passport or Emirates ID. Pack comfortable swimming attire, footwear, extra set of clothes, and a towel. Where are the snorkeling spots? Dibba Rock is a small rocky island with long sloping sides that are covered by a reef and surrounded by soft and boulder corals on each side. The sea is shallower on the west side of the rock which is perfect for snorkeling. The artificial reef in Fujairah is a man-made reef consisting of a series of concrete bulbs that were strategically placed under the sea to encourage coral growth and attract fish and other sea creatures. The sunken boat in the area is a favorite underwater playground for fish and small critters. Sharm Rock is noted for its three small outcrops of rocks that peak above the surface. The rocks are covered in soft corals which draw a plethora of marine life, making it a treat for snorkelers. Snoopy Island, named after its shape that resembles the famous Peanuts cartoon character, is surrounded by pristine beaches and luxurious resorts. The beautiful reefs brimming with shoals of reef fish are ideal for snorkeling. Dibba Rock is a great snorkeling site where you can encounter different species of turtles particularly Green turtles and Hawksbill. 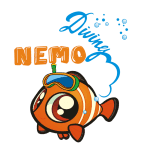 There’s plenty of fish to see here like the clownfish, parrotfish, porcupine pufferfish, bannerfish, double-line fusilier, lionfish, triggerfish, and the jawfish. Blacktip sharks may also be spotted cruising in these waters. Keep your eyes open for manta rays, devils rays, spotted eagle rays, and dolphins as well. If your timing is right, you might encounter seasonal visitors like the whale sharks. When you venture to the Artificial Reef, keep your eyes peeled for stingrays, barracuda, cuttlefish, squid, pufferfish, shoals of yellowtail, and other reef fish. You’ll also find crustaceans in the sunken boat. At Sharm Rock, you have a chance to encounter lionfish, boxfish, batfish, bowmouth guitarfish, porcupine fish, and other reef fish. Watch out for other interesting creatures like turtles, morays, and blacktip reef sharks. When you snorkel in Snoopy Island, you can encounter different kinds of reef fish, turtles, manta rays, stingrays, and blacktip reef sharks.